This darling house in Whitefish is just the place to call home for a short stay. 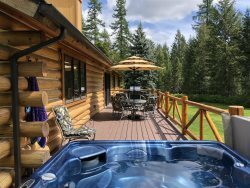 It is just minutes from downtown Whitefish and all the area has to offer. Cherry Tree Cottage gets it's name from the cherry trees in the front of the house. A cute porch frames the entrance to the home. When you come inside you'll quickly notice the charm. An open concept living room and dining room feature vaulted ceilings, a flat screen TV, and a cozy setting for enjoying life's simple pleasures. The main floor also features a fully furnished kitchen, a bedroom with a king bed, a full bath, and a laundry/mud room which leads to the garage. Upstairs will bring you to two additional bedrooms. One has a queen bed and the other has two twin beds. These rooms share another full bathroom. Enjoy privacy and sunshine in the small fenced backyard. There are several raised garden beds for the intrepid gardener. In Town Location, just minutes from downtown Whitefish!